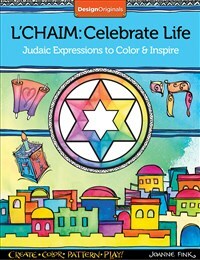 Inside this affirming coloring book are 32 pages of inspiring art activities that celebrate the wisdom and spirituality of the Judaic religion and its people. Joanne Fink, an award-winning designer, calligrapher, and author, spent 20 years as an art director in the greeting card industry. She specializes in developing products for the gift, stationery, craft and faith-based markets. With more than a million books in print, Joanne is the author of 17 books from Fox Chapel Publishing, including Complete Guide to Bible Journaling, Zenspirations® Coloring Book Inspirations, Flowers of Faith Coloring Book, and L'Chaim: Celebrate Life.